Posted on Thursday, November 20th, 2014 at 7:40 am. At thirty-five year old and with all his extra-curricular activities, from politics, to music, acting and basketball, Manny Pacquiao might not have much left inside a boxing ring. Despite signing an extension with promoter Top Rank until the end of 2016, it doesn’t necessarily mean that he will fight until that date. His next fight is scheduled for this Saturday night at the Venetian Casino in Macau, China, against WBO light welterweight champion Chris Algieri. Pacquiao will be defending his WBO welterweight title at a catch weight of 144 pounds. The main event and three other bouts will be broadcast live from the Asian city on HBO PPV. Pacquiao is a heavy favorite although the odds have been getting smaller as the day nears. Algieri, an educated man with a master’s degree, is virtually an unknown to even boxing fans having only been on HBO once before. In his last fight in June Algieri got off the canvas early to out-box the “Siberian Rocky” Ruslan Provodnikov and wrap the 140-pound around his waist. Undefeated in twenty fights and with only eight knockouts on his ledger, Algieri is still considered a threat because of his physical attributes, more importantly his height advantage. 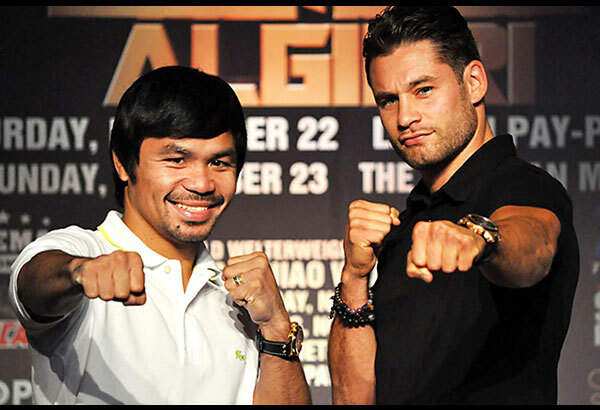 Algieri stands at five feet, ten inches while Pacquiao is five feet, six inches and a half. That is a considerable advantage as well as the difference of five inches of reach that Algieri boasts. This is an important fight for both but more importantly Pacquiao. A win here and it can set up his 2015 with quite possibly the most sought after bout in the sport. A loss would be devastating since it would give Floyd Mayweather Jr even more of a reason of why not to face the Filipino congressman. A loss against Algieri for all intents and purposes would mean the end of Pacquiao’s career as we know it. On the other hand, a win for Algieri would catapult him into super stardom. Well-spoken and without a pug’s face, Algieri looks like he would be more at home on a California college campus than a boxing ring. Algieri is a fighter though having made his bones as a kickboxer before finding his fame in the sweet science. Algieri came out west for his training camp instead of staying home in New York State. By setting up camp in Las Vegas Algieri not only enjoyed the attention of the fans who found their way to the closed down Mexican food restaurant doubling as his gym at the Palazzo but of the press as he was featured in a number of newspapers and publications across the United States. Top Rank’s Bob Arum says that the sales for this event have exceeded Pacquiao’s first foray into the Chinese market, last year’s lopsided beating of Brandon Rios. He does not hesitate to give credit to Algieri for the bump in sales since the thirty-year old carried most of the stateside promotion due to Pacquiao staying the Philippines to train and play basketball. IS ALGIERI READY FOR WHAT IS NEXT?